Fuji X-T100 Review -- Now Shooting! XF 50-140mm f/2.8: 111mm (165mm equiv. ), f/4.5, 1/640s, ISO 200. The Fujifilm X-T100 is a stylish camera that slots in somewhere above "entry-level" but not quite "high-end" within Fujifilm's X Series lineup. The camera features a Bayer-filtered 24-megapixel APS-C CMOS sensor -- not an X-Trans sensor -- and includes a built-in electronic viewfinder, tilting touchscreen and 4K video recording. The X-T100 isn't supremely fast nor equipped with the latest in Fujifilm's performance technology. However, it is a good value at under $600 for the body. XF 10-24mm f/4: 16mm (23mm equiv. ), f/5.6, 1/500s, ISO 200. This image has been modified. Click for the unedited, full-size image. Click here for RAW image. The X-T100 is a stylish and functionally-designed camera. It has a retro-inspired design with nice modern amenities, including a 2.36M-dot electronic viewfinder and tilting 3-inch touchscreen. On the top deck of the camera, there are three dials. The leftmost dial, which is located to the left of the viewfinder, is a function dial, is inmarked and is, by default, assigned to change the Film Simulation when in P, A, S and M shooting modes. You can customize this function dial to control other settings, including exposure compensation, shutter type, face/eye detection settings, movie mode, flash compensation, flash mode, release type, focus mode, AF mode, photometry (metering), white balance, dynamic range, image quality, image size, self-timer and ISO. To the right of the viewfinder is the main mode dial, which includes a wide assortment of modes, such as P, A, S and M shooting modes in addition to SR+ (automatic), scene modes, panorama shooting and more. The rightmost dial handles exposure compensation by default, but it can be set to control other things too much like the function dial on the left. Placed between the mode dial and the exposure compensation dial is a small function button. This controls ISO by default but can, again, be customized to your preferences. On the back of the camera is a vertically-oriented rear command dial -- there is no front command dial -- which also has a button press function. It controls aperture when in aperture priority and manual exposure modes, but handles shutter speed adjustments in shutter priority mode. In manual mode, the exposure compensation dial becomes a shutter speed dial. By pressing the rear command dial, you can magnify in on the selected focus point if not using the AF-All autofocus mode. The tilting touchscreen display works very well. Like other Fujifilm cameras, the X-T100 has a Q button on the back, as well. This brings up a grid of 16 user-selectable settings. This quick-access menu works very well for changing settings such as the metering mode and the autofocus modes. The Q menu is good, but you cannot use the touchscreen to navigate it, which is unfortunate. Speaking of the touchscreen, the articulating display looks good, feels quite sturdy and works well in bright conditions. When there is glare, it's easy to tilt it to make it easier to see. It tilts upward over 90 degrees and downward about 45 degrees, and you can also flip it sideways 180 degrees. When considering sharpness, the X-T100 does a good job of producing detailed JPEG images straight from the camera. In the image and crops below, we see impressive detail rendition without much evidence of excessive sharpening. Colors are rich, tones are smooth and there is plenty of detail. If you want a fine-tuned final image, you can, of course, shoot RAW and process them to taste. XF 10-24mm f/4: 24mm (36mm equiv. ), f/7.1, 1/640s, ISO 200. 100 percent crop. Click for full-size image. Click here for RAW image. The X-T100's native ISO range is 200 to 12,800, although it can be extended to ISO 100 to 51,200. In the images below, we see 100 percent crops from JPEG images shot at ISO 200 (base native ISO), ISO 3200, 6400 and 12,800. The images were shot through glass, so try not to make too many judgements regarding absolute sharpness. However, they still prove useful for comparing how the image quality changes as ISO increases. We have highlights and shadow areas to evaluate within the crops, as well. Note that the lens moved very slightly for a couple of the shots, which I didn't realize at the time of shooting, but it negligibly affects framing. XF 10-24mm f/4: 23mm (33mm equiv. ), f/8, 14s, ISO 200. 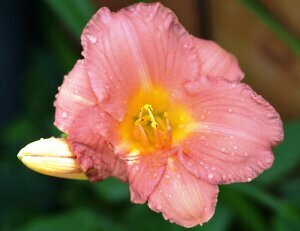 At ISO 200, we see good contrast, color and detail. While shooting through glass robs the image of some very fine detail, we nonetheless see well-defined edges, smooth tonal transitions and good image quality. XF 10-24mm f/4: 23mm (33mm equiv. ), f/11, 2.3s, ISO 3200. In this ISO 3200 shot, there are a few immediately apparent differences. There's of course a bit more visible noise, although it is quite well-controlled, and the fine detail rendition has degraded a bit. Further, tonal transitions are not as smooth. Overall image contrast and dynamic range has also decreased markedly. Nonetheless, the results are quite good for an APS-C camera at ISO 3200. XF 10-24mm f/4: 22mm (32mm equiv. ), f/11, 1.5s, ISO 6400. At ISO 6400, detail continues to degrade and the contrast decreases a bit further. Additionally, saturation has been reduced slightly. Still, image quality is pretty good. XF 10-24mm f/4: 22mm (32mm equiv. ), f/11, 0.8s, ISO 12,800. At the maximum native ISO, image quality is not very good. There is a lot of noise, particularly in shadow areas, and the image takes on a very processed look as the camera's noise reduction processing gets kicked into overdrive. I'd avoid this ISO, if possible. As we can see above, the X-T100 does an impressive job at ISO 200 through 3200. Image quality remains pretty good at ISO 6400 before becoming rather ugly at ISO 12,800. For an APS-C camera, particularly one at this price point, I am very impressed by the image quality from the X-T100. Like other Fujifilm cameras, the X-T100 comes with a wide array of "Film Simulations." These are digital filters aimed to replicate different film stocks from Fujifilm's illustrious history. They are considerably more in-depth than a simple filter, however, as they adjust many aspects of the overall appearance of an image. For example, Velvia does more than increase saturation, it also changes the tonal curve and image contrast. Classic Chrome does more than subdue colors, it also changes highlight and shadow tones. If you'd like a deep-dive into Film Simulations, click here. Below, we can see the standard film simulation, Provia, as it compares to Velvia (vivid) and Classic Chrome. Personally, I like Provia in many situations, although I do sometimes use Velvia in landscape shooting situations. XF 50-140mm f/2.8: 134mm (201mm equiv. ), f/2.8, 1/4s, ISO 200. Provia (standard) Film Simulation. Click for full-size image. Click here for RAW image. Velvia (vivid) Film Simulation. Click for full-size image. Click here for RAW image. Classic Chrome Film Simulation. Click for full-size image. Click here for RAW image. The RAW files from the Fujifilm X-T100's CMOS sensor are very flexible and versatile. The camera has a pretty good dynamic range anyway, but when you adjust shadows and highlights during RAW processing, you can bring out a lot more range in the image. Consider the shot below, which includes blown highlights and shadow areas which are too dark. With simple tweaks to shadows and highlights sliders (+100 shadows, -100 highlights and +0.2 exposure), there's a lot of additional detail you can extract from a RAW file. XF 50-140mm f/2.8: 69mm (102mm equiv. ), f/2.8, 1/250s, ISO 500. Original image. Click for full-size image. Click here for RAW image. RAW edit. Click for full-size image. Click here for RAW image. 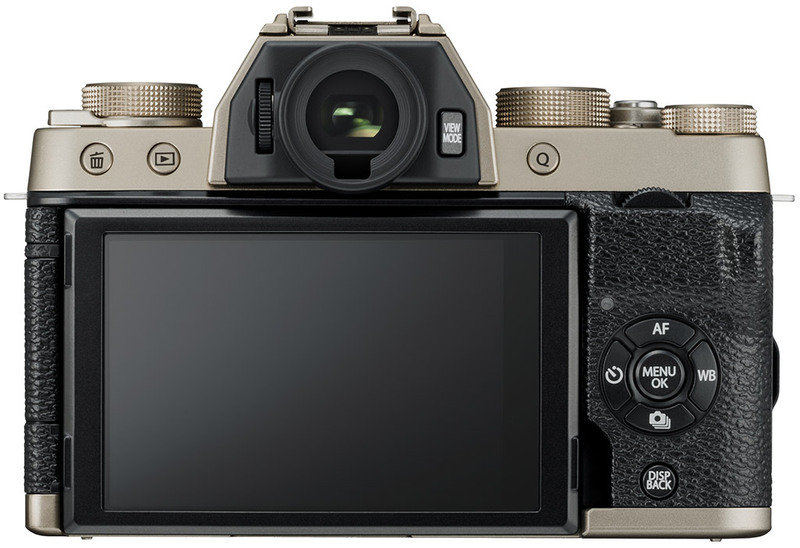 The 91-area hybrid (phase-detect + contrast-detect) autofocus system and touchscreen AF capabilities of the X-T100 are generally good. However, the autofocus system can be at times very indecisive and slow, particularly in low-light shooting situations. Further, face detection and eye detection do not work very well, nor does continuous autofocus hold up when shooting moving subjects. XF 50-140mm f/2.8: 140mm (210mm equiv. ), f/2.8, 1/640s, ISO 500. The X-T100 can shoot at up to 6 frames per second, which is reasonably quick, but the camera's buffer is slow to clear. Also, the camera feels sluggish during normal operation. Playing back images is not snappy, button presses are not always quickly registered and menus are slow to navigate. It can be frustrating when you are trying to capture a shot and the camera doesn't keep up. With built-in wireless connectivity via Wi-Fi and Bluetooth, the X-T100 has a standard suite of wireless features, including image transfer and remote control shooting. The connection proved easy to establish using my iPhone. The X-T100 has decent, although not spectacular, wireless functionality. Remote control functionality is decent. You can change numerous settings via the app, including ISO, aperture, Film Simulation and more. However, you cannot change the shooting mode nor does changing it on the camera reflect in the app until you re-establish the connection. The live view quality is good but the frame rate is choppy. Overall, the functionality is fine, but I have seen much better from other manufacturers. When considering video on the X-T100, it is a tale of two very different experiences. Let's consider the 4K UHD video recording, which is certainly a nice feature when it works well. On the X-T100, like the recent Fujifilm X-A5 camera, 4K UHD recording is capped at 15 frames per second. This is much choppier than even 24 frames per second -- a standard cinema frame rate -- and is not very useful when recording motion, which you often are doing when shooting video. 3840 x 2160 at 15fps, ISO 400 (base ISO during video recording). Recorded with Fujinon XF 35mm f/2 lens. The quality of the 4K video is fairly good, but the frame rate is a real issue. Further, the camera's autofocus does not perform well during video recording. On the plus side, there is a nice built-in timelapse feature which allows for 4K/30p time lapses to be shot and compiled in the camera. The ISO range when shooting video is 400 to 6400, rather than the 200-12,800 range when shooting still images. As you can see below, the video quality drops dramatically from ISO to 400 to 6400, but remains pretty good at ISO 6400, particularly if you are shooting with a 1920 x 1080 resolution. 1920 x 1080 at 60fps, ISO 400. 1920 x 1080 at 24fps, ISO 6400. The X-T100 can also shoot in high-speed mode, which allows for 4x slow motion videos. It's a neat feature and a nice option to have. 1280 x 720 at 100fps, played backed at 25 frames per second. With respect to usability, the touchscreen works nicely when recording video, letting you easily tap to move the AF box. The camera does have a dedicated movie record button, and its own movie section in the settings menu. Regarding the movie record button, there was often a significant delay, up to a few seconds, following pressing the button before the camera started recording video. Stopping the recording worked fine, but the start delay was frustrating. 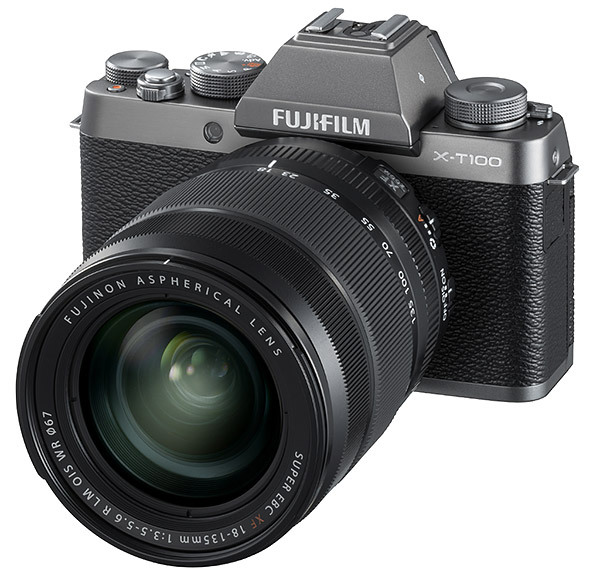 Overall, the Fujifilm X-T100 is an acceptable video camera with a limited feature set. Its primary use is certainly capturing high-quality still images rather than being a multimedia camera. 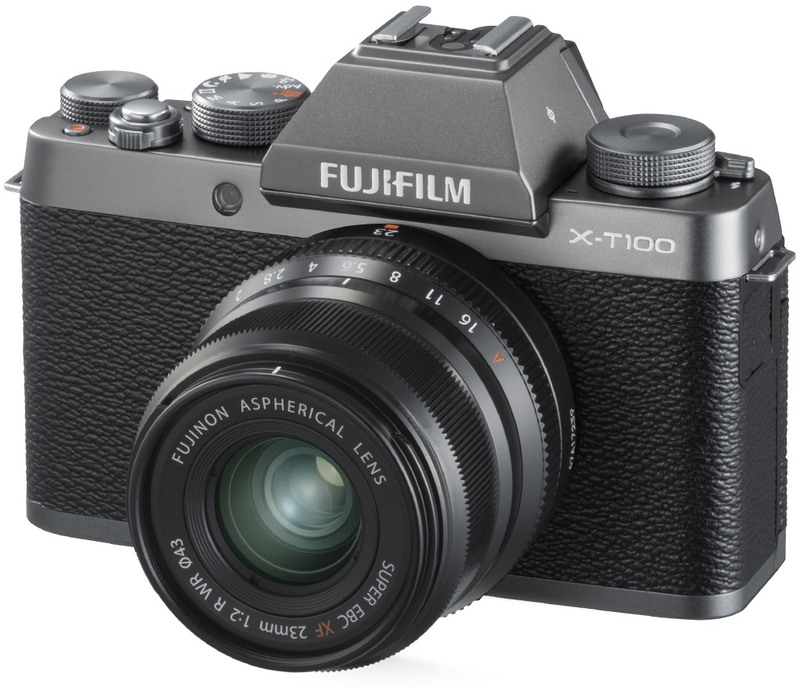 The Fujifilm X-T100 captures high-quality images using its 24-megapixel APS-C sensor. The camera's primary strength is its image quality. If you intend to use the X-T100 mostly for stills images, particularly of stationary or slow-moving subjects, then you will likely come away impressed. However, it does have some shortcomings. The autofocus performance is middling, at best, and the video features are limited. Further, the camera's performance can be sluggish at times as well. XF 10-24mm f/4: 10mm (15mm equiv. ), f/7.1, 1/30s, ISO 200. The camera body can be purchased for under $600, and the image quality is very good. Plus, the X Series system has a wide variety of excellent lenses, making it a nice system to enter, even with an entry- to mid-level camera body. There's room to grow with the X-T100, and for photographers just getting their feet wet with an interchangeable lens camera, there's a lot to like. If you need fast autofocus and better video features, I'd recommend looking at something a bit higher up in the X Series lineup. If you care mostly about image quality, the X-T100 can be a good option. 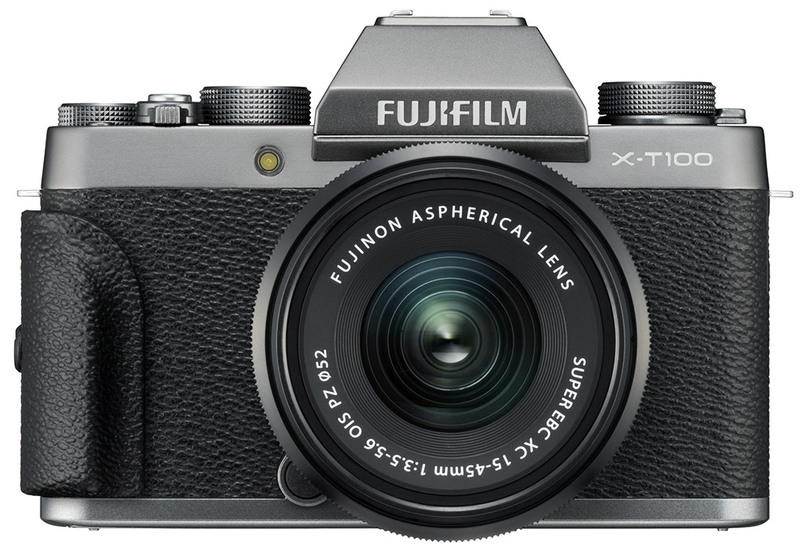 Fujifilm has long been creating stylish, lightweight interchangeable lens cameras as part of their X Series family, and their latest camera -- and brand new model line -- looks to be an interesting blend of performance and value while retaining a sleek retro design. The Fuji X-T100 is designed to be easy to use and intuitive yet offer high-end image quality at an affordable price point. Let's take a closer look at the camera's specs and features and learn how it separates itself in the ever-growing X Series lineup. The Fuji X-T100's body has a flat front and rear design with no protruding grip on the front (a detachable grip is however included in the bundle), and only a small one for your thumb on the rear of the camera. The camera is something of a cross between the recent X-A5 and the higher-end X-T20 in terms of appearance. The X-T100 eschews the X-T20's front command dial and borrows the vertical rear command dial of the X-A5. 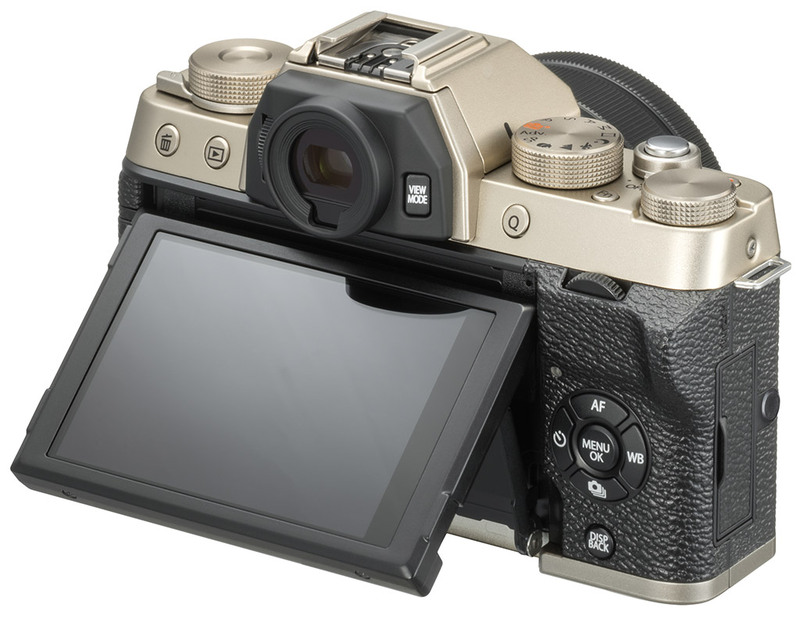 Where the X-T100 begins to separate itself from the X-A5 is with respect to the displays. Firstly, the X-T100 includes an electronic viewfinder, much like the X-T20. The X-T100 features a 0.39-inch OLED EVF with 2,360K dots and a 0.62x (35mm equivalent) magnification factor. The EVF also features an eye sensor. Further, the 3-inch rear touchscreen has a three-way tilt mechanism, meaning that you can also flip it to the side of the camera, whereas the X-A5 can only tilt up and down. The rear display has 1.04-million dots of resolution. Looking closer at the rear of the X-T100, we find four-way directional buttons (which double as function buttons), a display/back button and then a trio of buttons above the display, including a "Q" button to bring up the camera's touch-friendly and customizable Quick Menu. There's also a view mode button next to the EVF. Along the top of the camera, which is made from anodized aluminum, we find a trio of dials, including a standard mode dial that includes an improved SR+ Automatic shooting mode, which is designed to detect the subject and scene simultaneously. There's also a function button between the pair of dials to the right of the viewfinder. The X-T100 weighs just under a pound (448 grams) with a battery and memory card inserted. The camera is 4.8 inches (121 millimeters) wide, 3.3 inches (83 millimeters) tall and has a depth of 1.9 inches (47.4 millimeters). This makes it slightly larger than the X-A5 and X-T20. The camera comes in three different finishes: black, dark silver and champagne gold. The latter two colors are brand new to the X Series lineup. 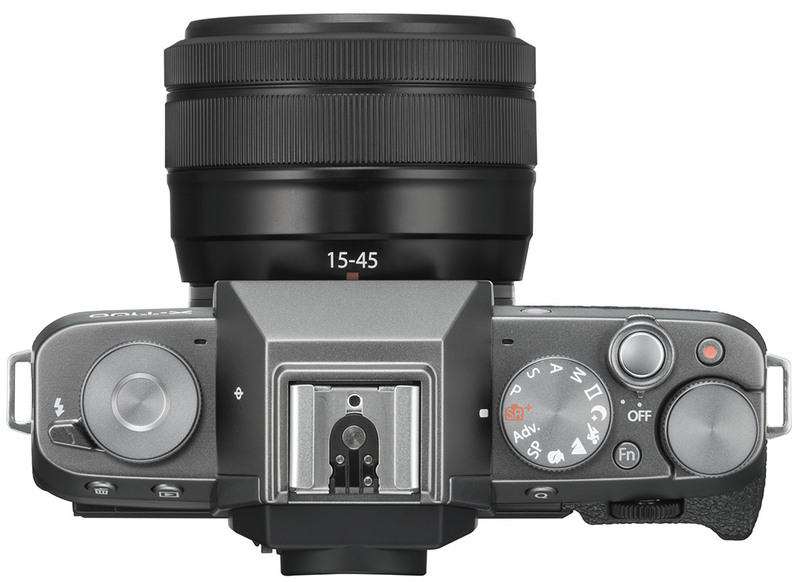 Like the X-A5, the X-T100 uses Fujifilm's latest 24-megapixel Bayer-filtered (non-X-Trans) sensor, which includes on-sensor phase detection autofocus pixels. This autofocus system employs the same autofocus algorithms as Fujifilm's flagship cameras and promises fast, accurate autofocus performance in a wide range of shooting situations. The X-T100 utilizes the same 24.2-megapixel APS-C CMOS sensor as the X-A5, which offers a native ISO range of 200-12,800. The ISO range can, however, be extended to 100-51,200. We have found that the X-A5 delivers very impressive image quality, so we expect much of the same from the X-T100. It is worth pointing out that the slightly more expensive X-T20 utilizes an X-Trans sensor like Fujifilm's higher-end offerings. 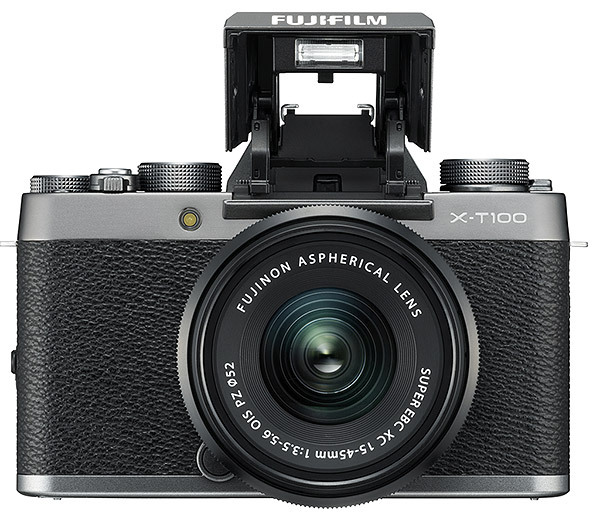 The X-T100 shown here in dark silver with included removable grip attached. The autofocus system includes multiple modes: single point, zone AF and wide/tracking AF modes. There are five different sizes you can choose from for single point AF, and when using Zone AF, there are 91 areas usable as 3 x 3, 5 x 5 and 7 x 7 squares across the 7 x 13 grid. With Wide/Tracking AF mode, there are up to 18 usable autofocus areas. You can utilize touch autofocus with the rear display as well. Looking at performance -- which will need to be verified by our lab testing -- we find moderate speeds. Fujifilm claims the X-T100 is capable of continuous shooting at up to 6 frames per second with a JPEG buffer of 26 frames. While that's a noticeable improvement over the X-A5's 10 JPEG spec, the buffer is still not very substantial, and it'll be interesting to see how it does with RAW image capture. The X-T100 claims a 0.4-second startup time when High Performance mode is enabled, which is pretty quick and twice as fast as the default startup time. Battery life is CIPA-rated at 430 shots per charge in Normal mode with no information about High Performance mode battery life, but you can expect it to be noticeably less. The battery is the lithium-ion NP-W126S, for those curious, which is the same battery pack used for multiple, current Fuji cameras. There are a lot of interesting shooting features with the Fuji X-T100. 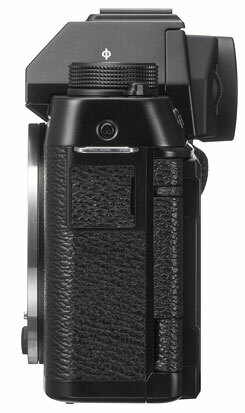 In addition to its SR+ mode, the camera offers the full suite of semi-automatic and manual shooting modes you expect from an ILC, but it also offers neat shooting features such as Motion Panorama (up to 2160 x 9600 pixels in vertical mode and 9600 x 1440 in horizontal mode), Advanced filters and, of course, Film Simulation modes. The Advanced filters include options such as Toy camera, Miniature, HDR Art and more. Film Simulations will be familiar to Fujifilm shooters; there are the same 11 types you've come to expect: Provia, Velvia, Astia, Classic Chrome, Pro Neg Hi, Pro Neg Std, Monochrome (with three color filters) and Sepia. There's no Acros setting like there is on some other more expensive Fujifilm cameras, but otherwise, it's the standard suite. On the video side of things, the X-T100 is much like the X-A5. This means that it offers 4K UHD video recording, but with a maximum frame rate of only 15 frames per second, which is quite limiting. The maximum clip length is however much improved to 30 minutes, versus only 5 minutes for the X-A5. Full HD video, fortunately, can be recorded at up to 60 fps, but still for only 30 minutes per clip, although again that's an improvement over the X-A5's 14 minute limit. If you want higher-speed recording, there's a High Speed mode that records at up to 4x slow-motion with a 1280 x 720 resolution. In addition to 4K video, the X-T100 also offers 4K Burst and 4K Multi Focus still frame shooting modes, allowing you to capture 8-megapixel still images at 15 fps and the ability to select from multiple focus points after capturing frames. The X-T100 includes built-in Wi-Fi and Bluetooth (version 4.1, also known as Bluetooth Low Energy), which allows you to remotely control the camera and transfer images to your phone or print to an Instax printer. You can also geotag your images using a connected GPS-enabled smartphone. The camera uses SD cards (UHS-I) for storage, and has Micro-B USB 2.0 and Micro Type-D HDMI ports. The camera also includes a 2.5mm microphone/remote jack. The Fujifilm X-T100 will be available body only or as part of a kit with the Fujinon XC 15-45mm f/3.5-5.6 OIS PZ lens. The body only will sell for US$599.95 in the U.S. and for CA$749.99 in Canada. The kit will be available for $699.95 and $899.99 respectively. Both the body and the kit will be available starting on June 18 in black, dark silver and champagne gold.